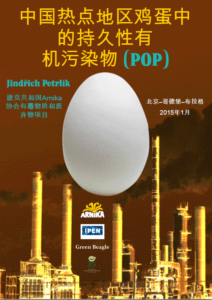 Following the 2014 Twinning exchange, Arnika and Nature University collected samples from chicken eggs at several pollution hotspots in China. Chicken eggs have been found to be sensitive indicators of POP contamination in the soil and in dust, and are an important exposure pathway from soil pollution to humans.The samples were analyzed in Czech laboratories and the results summarized in a report. The results found the eggs to be contaminated with dangerous and toxic pollutants, such as dioxins. The follow-up action will be to translate this report into Chinese and visually enhance the material for publication. It will then be disseminated to the general public and media. Additionally, further samples from a hotspot in Likeng will be acquired and used to substantiate the report’s findings. ‹ The tendering for the 2016 EU-China NGO Twinning Exchange Program is open. Apply now!